Catch the race on NBCSN, March 31 at 4:30 p.m. ET. 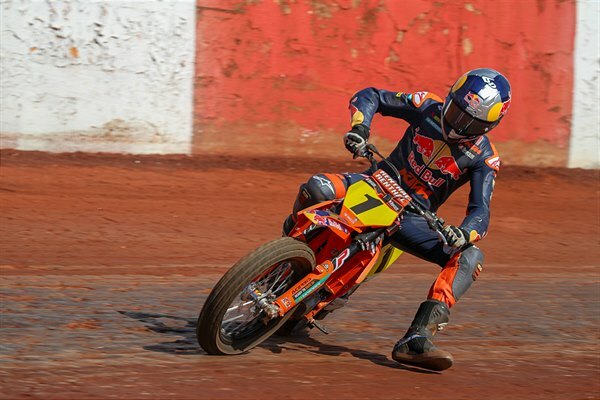 WOODSTOCK, Ga. – Estenson Racing’s Ryan Wells crossed the line fourth Saturday night at the Atlanta Short Track, round two of the American Flat Track season at Dixie Speedway. That result was later disqualified following a post-race technical inspection for exceeding the maximum allowable weight for a rear wheel assembly by one pound. WOODSTOCK, Ga. – Round 2 of the 2019 American Flat Track Championship took place over the weekend with the Atlanta Short Track at Dixie Speedway in Woodstock, Georgia. Red Bull KTM Factory Racing’s Dan Bromley captured his second-straight podium finish with third overall in the AFT Singles Main Event, while his teammate, Shayna Texter, rode to a top-10 finish in ninth. Bromley, the 2018 AFT Singles Champion, started off the day with a solid sixth-place in qualifying, which gave him a favorable front-row start in Heat #2. Bromley powered his KTM 450 SX-F FACTORY EDITION into second-place off the start, where he quickly made his way into the lead by the second lap. From there, he held strong to secure the heat race victory. Bromley then lined up in Semi #1 where he battled with his teammate Texter early on. With a second-place start, Bromley swapped the lead position with Texter a few times through the first three laps but a restart brought their momentum to a halt as they each lost a position upon the new start, filing into second and third, respectively. Bromley held on to the second-place position all the way through the checkers. With a front row grid position for the Main Event, Bromley got off to a second-place start as he chased down the leader early on. As the race wore on, Bromley began losing ground on the race leader so he switched up his line selection in an effort to close the gap. About 10 laps in, Bromley reverted back to his original line selection and ultimately lost some time in the process, where he dropped back to third on lap 12. From there, the defending champion focused on maintaining his speed and crossed the finish in third to continue his consistent start to the season. Texter qualified 13th overall earlier in the day, where she got off to the early lead in Heat #1. Texter continued to battle for the lead early on before settling into second place, where she would ultimately finish in the heat. In Semi #1, Texter lined up alongside her teammate, Bromley, and the duo diced back and forth through the early laps. It was Texter who claimed the early lead aboard her KTM 450 SX-F FACTORY EDITION before swapping spots with Bromley on lap two. Texter reclaimed the lead on lap three before the restart took place. She dropped to third off the restart and from there she battled for the final podium position, ultimately securing third in the Semi. In the Main Event, Texter began on the front row as she powered her way into a top-five position off the start. She battled in sixth for the first half of the race before getting shuffled back to ninth in the final laps. With three laps to go, Texter held strong to maintain a solid ninth-place finish at Round 2. Strong start for Dalton Gauthier and his new team for 2019! Dalton Gauthier and D&D Cycles Team kick off 2019 with strong results and currently lead the American Flat Track Pro Singles Points after two rounds. Gauthier, proving his versatility by running two completely different brands in the first two races with a KTM provided by Johnny Lewis/MotoAnatomy at Daytona and JMC Racing Honda from Jay Maloney and Jake Constantine for Atlanta. Team owner and crew chief for Dalton, Rob Mclendon (Robby-Bobby around the racing world): “We weren’t even planning to run the first two events, as Dalton was finishing up his Road to Recovery so we were planning on just focusing on returning for Texas and next thing you know, we are headed to work The Steve Nace All Star series in Savanah and we got the call that we’ve been hoping for. So then we’re scrambling trying to find ANYTHING to race. We had 2 bikes lined up but they fell through so at the last hour Johnny Lewis rented us a stock KTM that he used for his schools and we just had to prep it. Luckily he had his crew there to help and we turned a trainer bike into a professional bike in less than a day. Can’t thank those guys enough. "Then for Atlanta, we were back at square 1 as Johnny’s KTM was back in school duty so we got a call from the JMC team and they offered a Honda while our Husqvarna was still in development. We got to Atlanta and Dalton was just fired up from the start. They gave us a really good horse and Dalton did his job and did it well. "I have finally gotten the time to finalize our Husqvarna FC450 and hopefully we get the funding to build a backup bike before the west coast round. I’m really impressed with the platform and I’m confident that I can build him a very capable machine!" Dalton Gauthier #122: “I am so thankful to be back on a motorcycle. I have put in so much work with Robby training me and working me so hard at Pensacola Dirt Track. I’ve been averaging 1000 laps per week and we’ve had lots of riders come in and train there so we are constantly riding with new people. Coming to Daytona our goal was to just make the main. We knew we had a stock bike and can’t thank Johnny enough for the rental. We made a bunch of changes and I started the day 31st in Qualifying and finished the main in 2nd behind Jesse.